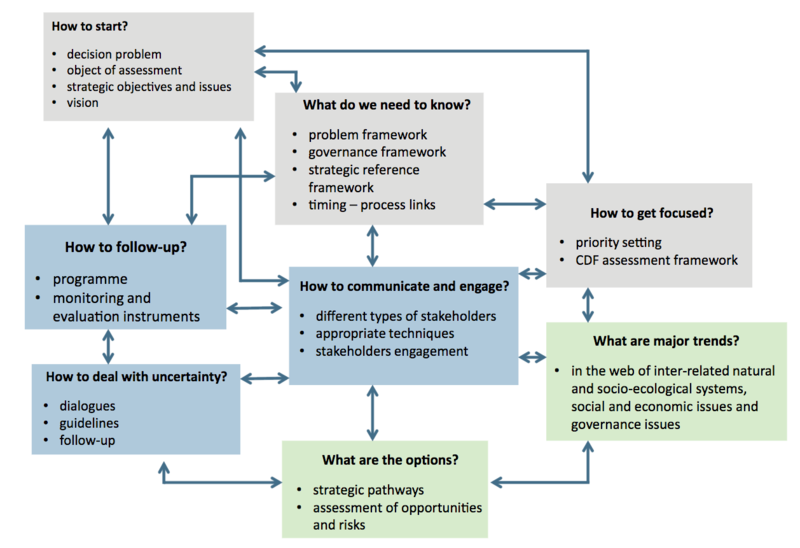 The purpose of the Strategic Environmental Assessment (SEA) Guide is to offer practical guidance on how to do SEA in an innovative and sustainability oriented way, using strategic thinking. The guidance applies to all actions that are driven by long-term strategic objectives. 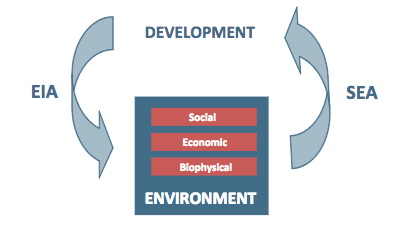 SEA can help decision-making set trajectories for sustainability by facilitating the integration of broad environmental (biophysical, social, institutional and economic) issues to create enabling development conditions. 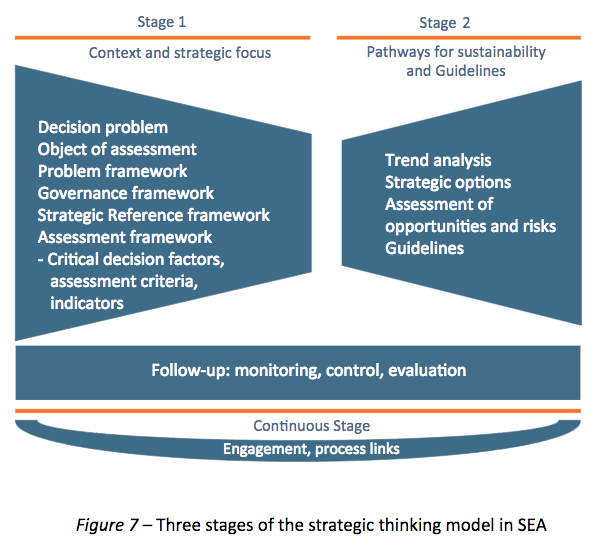 The SEA approach follows a strategic thinking model with an integrative, holistic and transversal (cross-sectorial and interdisciplinary) nature, illustrated by case-examples from Portugal and elsewhere. This Guide is a revised and updated version of the methodological guidance adopted and published in 2007 by the Portuguese Environment Agency (APA - Agência Portuguesa do Ambiente). Based on past and current practices of SEA, and also on inquiries in relation to the practical implementation of the 2007 guidance, this Guide clarifies concepts, the actual doing of the SEA as a strategic-oriented assessment, most frequently used techniques and examples of how SEA can be an instrument of strategic nature and ensure compliance with European and Portuguese legislation. What guidance is available on how to undertake SEA? 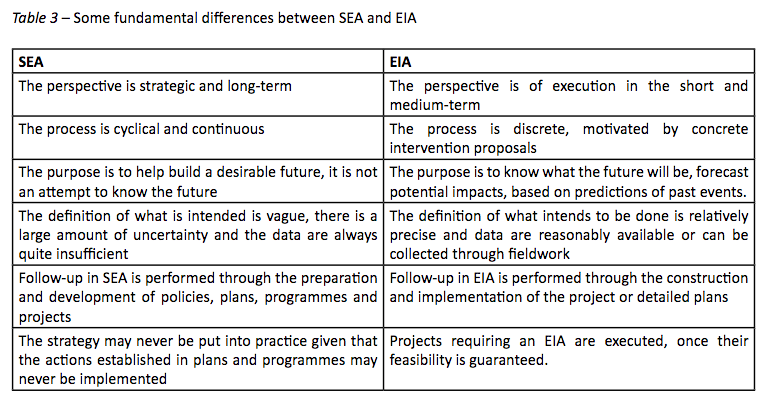 What is the difference between SEA and EIA? 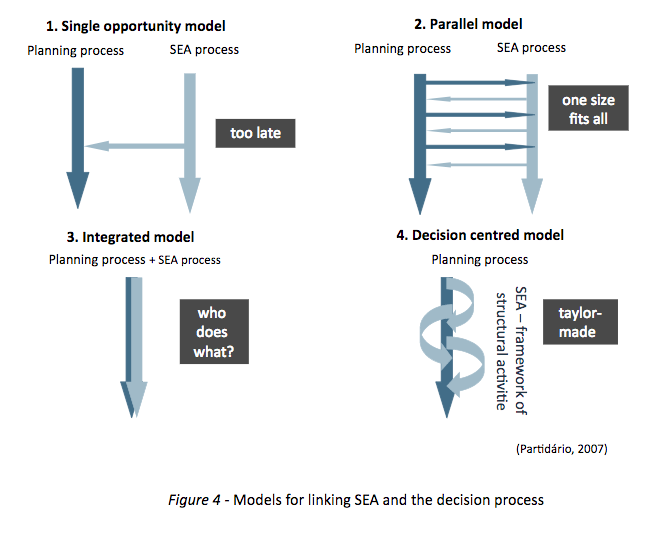 How does SEA relate to and inform the broader planning process? SEA is practiced globally; in Europe it is driven by the SEA Directive. However, while the concept is well-known, its implementation is highly variable and there is flexibility within a particular institutional context to design quite different processes. 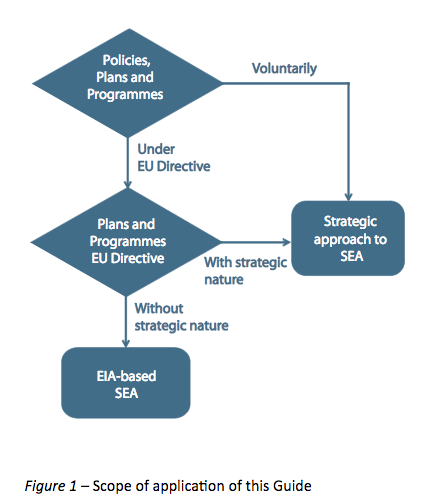 Given the similarities in logic between SEA and EIA, there can be a tendency to attempt to follow an ‘EIA-style’ SEA, which is often problematic due to the amount of specificity and data that is required to make such conclusions at a strategic scale. 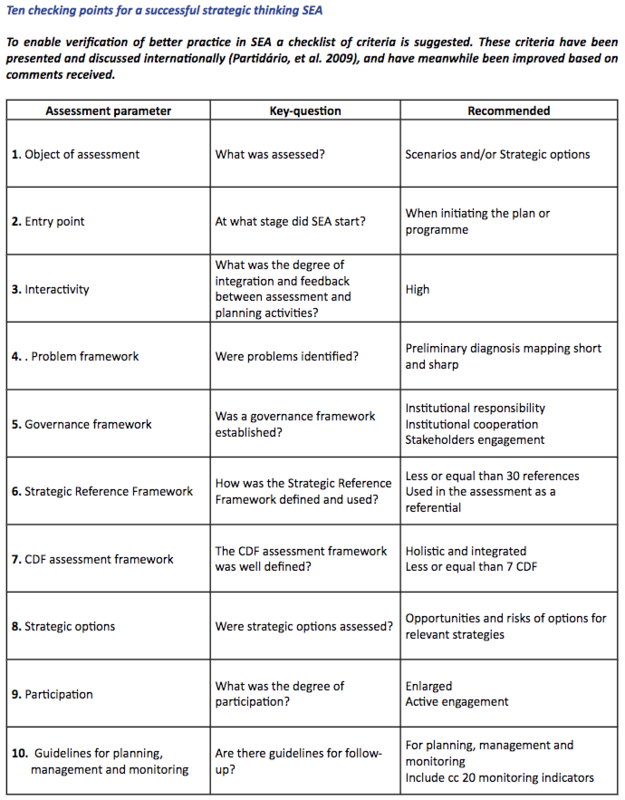 This report sets out and promotes greater emphasis on the ‘strategic’ aspects of the assessment, enabling greater benefits of the SEA process to be realised. Figure 1 clarifies the scope of application of the guidance. 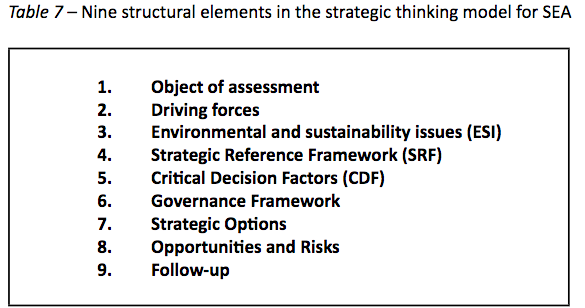 Offer practical guidance on how to do SEA in an innovative and sustainability-oriented way, using strategic thinking. Public institutions that formulate, develop and implement actions with long-term strategic objectives through planning and programme development, in accordance with the legislation, and for their consultants that conduct associated studies. Private and other public organizations that do not fall in the above group, including decision-makers and technical professionals, that wish to use SEA to facilitate integrated approaches in planning and investment strategies, with the objective of generating more sustainable processes and solutions. Non-governmental organizations and all those seeking to broaden their capacities, with a view to increase learning processes and build knowledge through stakeholder engagement and public participation. The guide is a revised and updated version of the methodological guidance adopted and published in 2007 by the Portuguese Environment Agency (APA - Agência Portuguesa do Ambiente) (Partidário, 2007). Based on past and current practices of SEA, and also on inquiries in relation to the practical implementation of the 2007 guidance, this guide clarifies concepts, the actual doing of the SEA as a strategic-oriented assessment, most frequently used techniques and examples of how SEA can be an instrument of strategic nature and ensure compliance with European and Portuguese legislation. 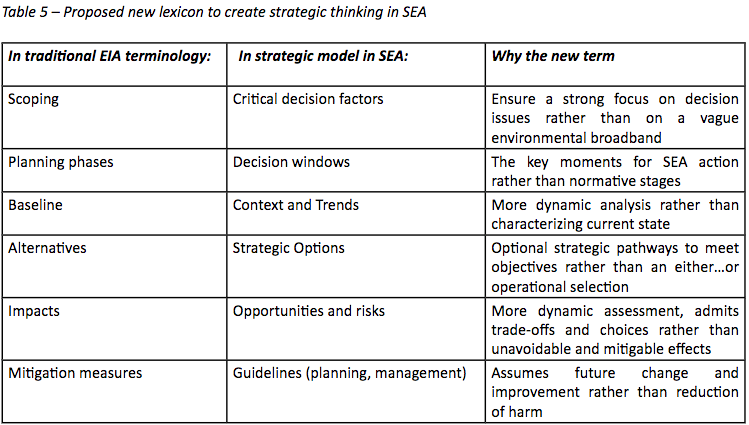 The report presents very detailed guidance for a systematic approach to SEA. The report of the review is available online at: http://ec.europa.eu/environment/eia/pdf/2012%20SEA_Guidance_Portugal.pdf. proposes a building block approach for doing SEA, following an integrated process approach, that is decision-centred and sustainability driven. Practical directions and examples are given. The guidance is primarily aimed at public authorities and consultants undertaking SEA in Portugal. However, since the SEA Directive is applicable across all Member States, the guidance presented here may be of use in considering how to undertake SEA or improve practices across countries other than Portugal. It is not specific to SEA in relation to marine spatial planning however the general principles are useful in this context.